After years of declining sales and store closures, Sears Holdings Corporation has officially filed for bankruptcy. 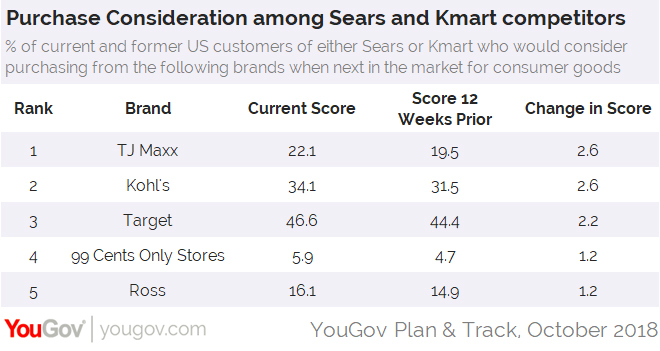 The latest data from YouGov Plan & Track shows that the general public’s openness to buying from either Sears or Kmart (both subsidiaries of Sears Holdings Corporation) has been decreasing for some time. In January 2015, for instance, 23% of US consumers aged 18+ said they'd consider shopping at Sears when next in the market for consumer goods, such as clothing or home furnishings. At present, that number has dropped to 13%. Likewise, Kmart’s Purchase Consideration score has dropped from 19% to 9% throughout the same time period. Not all brick-and-mortar retailers, however, are suffering from similar declines. 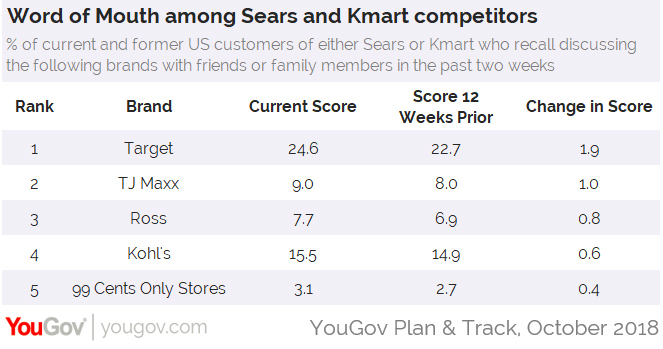 Indeed, additional figures suggest that competitors of Sears and Kmart might actually be benefitting from the current climate. TJ Maxx, for example, has seen a rise in Purchase Consideration among current and former customers of either Sears or Kmart, moving from 19.5% 12 weeks ago to 22% today. Kohl’s, Target, 99 Cents Only Stores, and Ross also show increases in Purchase Consideration among current and former Sears and Kmart customers. More current and former Sears and Kmart customers are talking about the five rival retailers, too. Since 12 weeks ago, the amount of Sears and Kmart customers who recall discussing Target in conversation with a friend or family member recently has climbed from 22.7% to 24.6%. The remaining four brands have also experienced Word of Mouth gains ranging from 0.4% to 1.0%.